24 December 2014, Colombo, Sri Lanka: The second online survey conducted by the Centre for Policy Alternatives saw 76% of the respondents stating that a stronger democracy is more important to them than a stronger economy. When asked if the Constitution should limit a President to a maximum of two terms, irrespective of how popular he or she is, 86% of respondents agreed with this statement and only 6% of respondents said that there should be no Constitutional limit on how many terms the President can serve in order to allow strong Presidents to serve the country. A key issue that is being discussed at present is whether or not the Tamil community should vote in the upcoming elections. 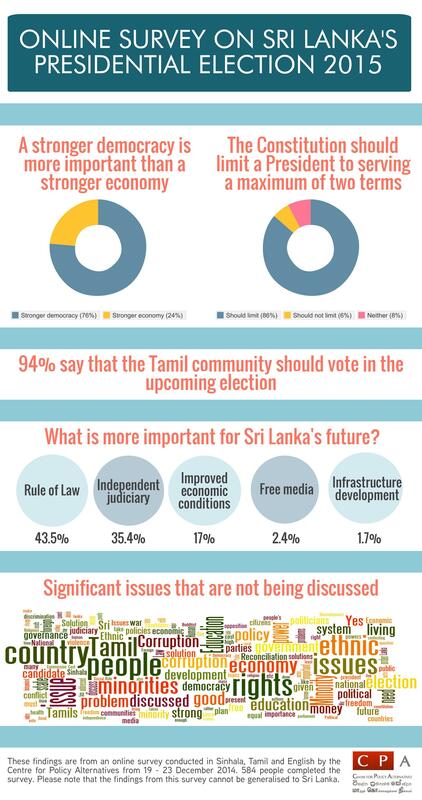 94% of respondents believe that the Tamil community should in fact vote. Given a list of five priorities that are considered important for Sri Lanka’s future and asked which one they believe is the most important, Rule of Law was selected by most respondents (43.5%) as a top priority, followed by independent judiciary (35.4%) and improved economic conditions (17%). The final question asked respondents if there was an issue that they felt was not being discussed or was not being discussed enough. Issues related to minority rights, ethnicity and the Tamil community, education and unemployment was what was most mentioned by respondents. The survey was conducted in Sinhala, Tamil and English and was completed by 584 people during the survey period 19 – 23 December 2014. The objective of the survey was not to predict election results but to gather public opinion on the elections and contribute to ongoing discussions. As the survey was conducted online and not with a random sample, the findings cannot be generalised to Sri Lanka. Download the infographic below as a high resolution image from here.